R52nM is end of life (EOL). 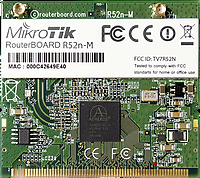 MikroTik recommends R52HnD for functional replacement. The RouterBOARD R52nM miniPCI network adapter provides leading 802.11a/b/g/n performance in both 2GHz and 5GHz bands, supporting up to 300Mbps physical data rates and up to 200Mbps of actual user throughput on both the uplink and downlink. Adding Wireless N to your Wireless device, it provides higher efficiency for everyday activities such as local network file transfers, Internet browsing, and media streaming.